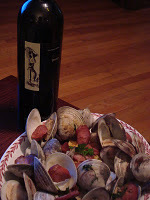 This week, our recipe for Steamed Clams with Linguica is being featured at Simple Recipes. 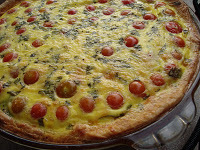 And we just found out that our recipe for Caprese Quiche is on the Eggland's Best website. And we found out that the Caprese Quiche recipe has been chosen by Wegmans (a supermarket chain in MA, MD, NJ, NY, PA and VA) to be printed up on a recipe card that will be available to customers in all 80 (and counting!) of their stores. Pretty cool, huh? We are most excited about these recent developments, and want to say "Thanks!" to the Fullers at Simple Recipes, and the folks both at Eggland's Best and Wegmans. Congratulations! You deserve the recognition! Congrats! I remember that recipe, and it looked delicious.